"They destroyed everything he had, everything he was. Now, crime has a new enemy and justice has a new face." Darkman is a superhero action film from 1990 and was directed by Sam Raimi. Peyton Westlake is a scientist who barely survives industrial sabotage of his lab, although his body is riddled with extensive scarring from the fires. Eventually, Peyton is able to cobble together another lab and create a synthetic skin that, although functional for only a limited amount of time, will allow him to pose as the minions of the man responsible for his attempted murder. In addition to seeking a way to perfect his replacement skin, Peyton hopes to find a way of reuniting with his girlfriend. 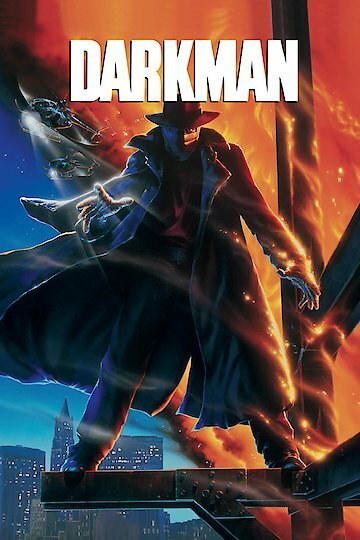 Darkman is currently available to watch and stream, download, buy on demand at Amazon Prime, Amazon, Vudu, Google Play, FandangoNow, iTunes, YouTube VOD online.